Last night was my first time ever going to the Conservation Congress, so I’m going to outline my experience for people who plan to go in the future. We registered between 6:30 and 7. There were white tables in front of the entry to the PAC, and we wrote down our names and addresses, and were handed the question packet and three voting ballots. The next table over, we showed our IDs and were given tiny ballots to write the name of the delegates. We sat in a cluster of Alliance people so I would have the best chance of people finding me if they needed a cheat sheet. We all started filling out our white ballots, flipping between the question packet and the cheat sheet. The actual talking portion started a little after 7. The game warden introduced the event, and his words were supplemented by a powerpoint. He enunciated well, but spoke stiffly, and gave the impression of reading directly from a manual, the way that teachers always have to for standardized tests. The first election was for the 3-year term. There was a period of time to nominate delegates. Two were nominated. Each took a turn speaking. While the votes were counted, the game warden started to read through the questions in the packet. He read every.single.question, except for the local measures. I had mixed feelings about this. It’s good to have multiple ways to communicate information for different learning styles and intelligences, and it may have helped people with reading disabilities, so that’s very cool. But it was so dull and so long. We also watched a fishing video during this first hiatus. After the votes were counted, they announced the winner – the incumbent, Paul Reich. The same voting process was then repeated with the 2-year term delegates, then more question reading as those votes were counted. The 2-year term delegate was also the incumbent, Melissa Smith. Yay, Melissa! I also liked Paul. He seemed like an ethical person who could get things done. 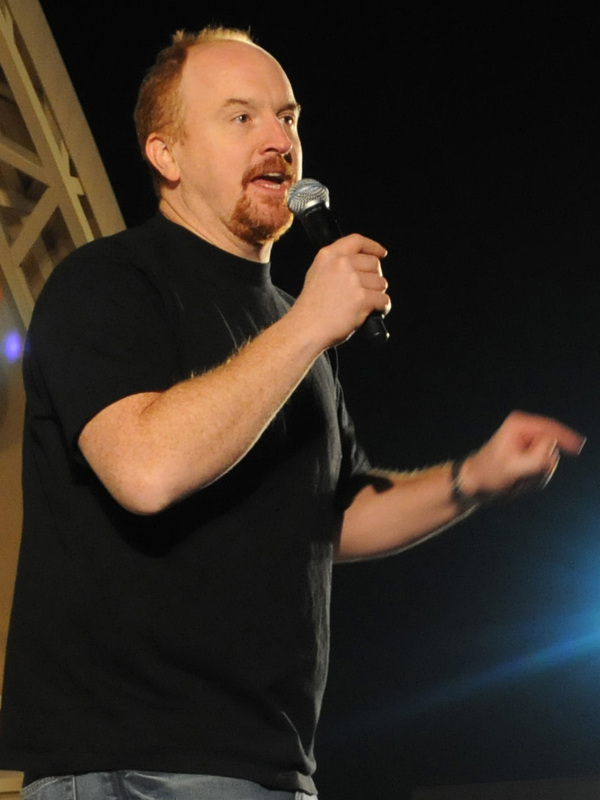 Also, he looked kind of like Louis C.K.! The DNR guy finished reading all the questions on the white ballot, then we moved to the blue ballot. The blue ballot concerned citizen proposals, all of which were taped on the wall outside the PAC. The savvy people knew this and had already taken pictures with their smart phones. I was not one of those savvy people, so I had to run out halfway through and do so. The citizen proposals inspired a lot more crowd commentary than the DNR proposals. We left right before they were going to read the questions for the green ballot. It was about 9 pm. I’m guessing the event went until 9:30 or 9:45. I was definitely not the only animal lover there, and I didn’t feel out of place. I was warned by others that the Conservation Congress can be an uncomfortable place to be if you’re non-consumptive (not a hunter/trapper/fisher). Because of this, I asked my mom to go with me. Even if she hadn’t been there, we had a contingent of maybe 15 Alliance people, most of whom were sitting together. The auditorium was huge, and there were only 200-some people there, so I was physically distant from the people who identified as hunters. It is long, but there are multiple options to leave early. The only thing you have to physically be there for is the election of the 3-year and 2-year term delegates. That happens in the first hour. The rest of the time, the DNR reps read the questions that you vote on on the three different colored ballots. You can follow along, or you can fill them out ahead of time, especially if you have a cheat sheet! I did enjoy the citizen commentary, and I learned a lot. The reason to stay is that, after each question, there is an option for citizen comments and questions. It’s rare that what a citizen said changed the way I voted, but a lot of them were knowledgeable, and I’m glad I heard what they had to say. “Conservation” is a bit of a misnomer, since the only issues we voted on are in regards to game species. Nothing about other wildlife, nothing about other environmental issues. So, there are three different voting cards we fill out. The white is for issues that have passed their specific committees and will be enacted if voted on. I didn’t stay to hear what the green was, but I think it’s similar to the white. The blue is for citizen proposals. If those pass, they are sent to a series of committees in the DNR, and they may eventually become issues for the white ballot. The white and green ballots only covered game species. The blue ballot had a range of proposals about keeping science in the DNR, doing a full impact study about the oil pipeline, making the voting process more transparent, educating the public, and my favorite, having online voting! When my mother and I Ieft right after the citizen proposals had all been voted on, her response was “that was a lot more balanced than I would have thought.” I agreed at the time, but I’m not sure in retrospect. The only issues where there was balance were the issues where voting didn’t mean that much. Assuming that it’s been this way every year, I think it says something that there’s significant disparity between the green/white ballots and the blue ballots. But let me know if I’m misinterpreting! People really don’t like Cathy Stepp. Which is, of course, totally justified. But my favorite part about the blue ballots is that they had at least three proposals that clearly had the goal of never having someone like Cathy Stepp as secretary again. I have no idea how anyone answers all those questions without a cheat sheet, and without reading the questions ahead of time. It’s just a lot, a lot of reading and information to do all at once. A lot of the comments on citizen proposals were by people who cared about animals, the environment, or wanted hunters and conservationists to work together. It was kind of inspiring. OVERALL: It’s definitely not my favorite animal related activity, but I feel like it’s an important thing I can do for wildlife, and it’s only one night a year. I appreciate the option to leave whenever we want. I would appreciate even more the option to vote online, but I’m glad I went this year, and I hope to see even more of you at the next one! Tonight is your chance to cast a vote for Wisconsin’s wildlife. Care about Wisconsin wildlife? 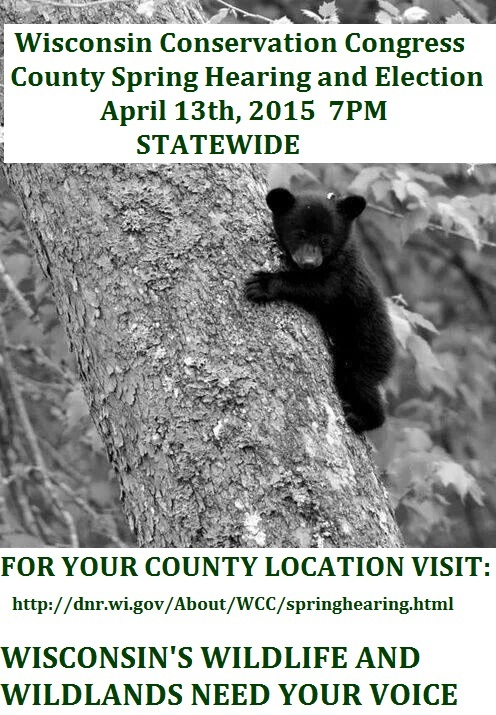 Then mark your calendars for Monday, April 13, 2015 and plan to attend the annual Conservation Congress spring hearings. The Congress offers an unparalleled chance to inform DNR and NRB decision-making, and in recent years it’s been dramatically over-represented by hunters, trappers, and other “consumptive” groups. Wildlife advocates, we need you at the table! Every county is allotted two delegates to the Congress, so please consider running for a seat. The time commitment is modest, considering what’s at stake. 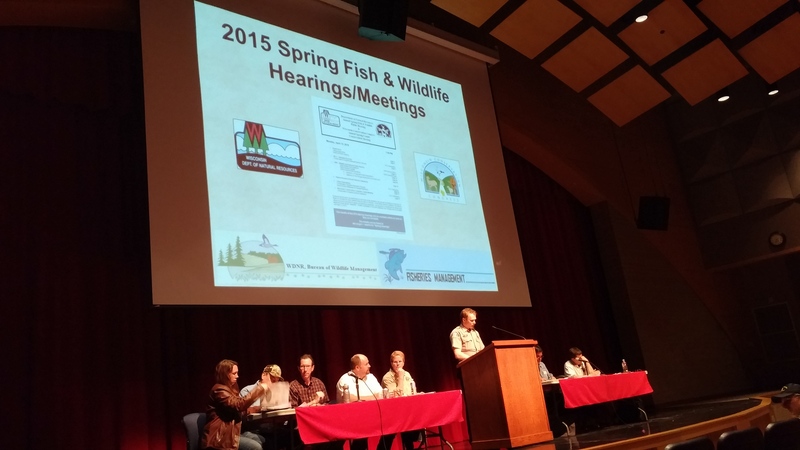 If you aren’t interested in running, please still plan on attending your local spring hearing next April – in just one evening, you’ll have the chance to vote on a wide range of issues affecting Wisconsin wildlife. Click here to see the 72 locations across Wisconsin. Click here to read the issues you’ll be voting on. Click here for a voting cheat sheet from delegate Melissa Smith and here for a voting cheat sheet from Madravenspeak’s Patricia Randolph, or download below. 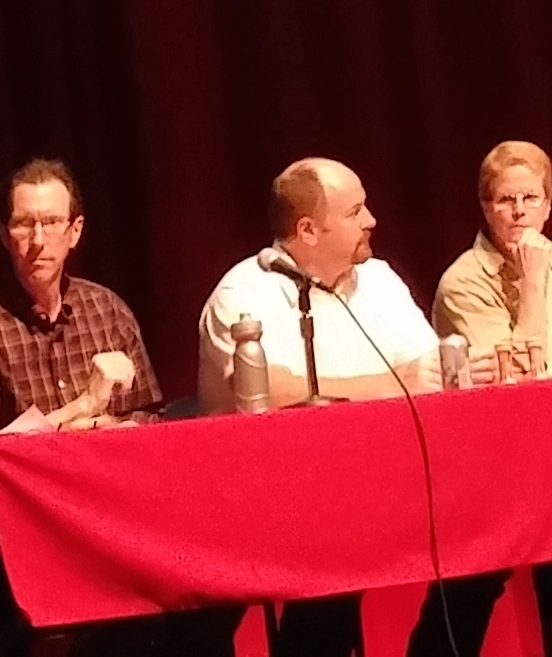 Patty Lowry had never been to a meeting of the Wisconsin Conservation Congress before attending the group’s spring hearing last week at Sun Prairie High School. But her interest in the group has grown since she learned it was behind the recently passed state law allowing trapping and expanded hunting in state parks. “I started hearing that the Conservation Congress had a tremendous amount of power and had a lot of clout with the Department of Natural Resources and the Legislature,” says Lowry, who lives in Madison. The Conservation Congress is an advisory body to the DNR made up of elected delegates from each county. Lowry was one of the 662 people who packed Sun Prairie’s performing arts center April 8 to elect two Dane County delegates and to vote on numerous matters related to fishing, hunting and conservation. The turnout was higher than average, says Kari Lee-Zimmermann, the staff liaison between the Congress and the DNR, as it was at some of the other meetings held the same night in each of the state’s 72 counties. Lowry says she and others new to the group turned out because they’re appalled at recent state wildlife management decisions, including those that permit wolf hunting with dogs and hunting and trapping in state parks. This backlash likely cost Matt Rainey his seat on the five-person Dane County delegation, as Melissa Smith beat him out for a two-year term in the first election of the evening. Another incumbent, however, held onto his seat for a three-year term. The DNR board in December scaled back the new state law on hunting and trapping in state parks, allowing these activities roughly two months of the year. The results of the statewide ballot (PDF) distributed at the spring hearing, however, in which 2,922 people voted in favor of expanded hunting and fishing in state parks and 1,922 were opposed, suggest there could be a renewed push to revisit this issue. The survey results will be discussed at the May convention of the Conservation Congress, which will then forward final positions to the DNR and its board. Rob Bohmann, chair of the Conservation Congress, declined to speculate on how the body will vote. But Dan Schuller, director of state parks at the DNR, suggests in a statement that some longtime hunts in select parks could be reinstated. These are special seasons that fall outside the two-month window specified in the December 2012 DNR board ruling. “We are looking at some seasons that were previously approved by administrative rule,” says Schuller. Lowry is incredulous that this issue might be reopened after more than 2,000 comments — most of them critical — were submitted to the DNR in response to its original proposal that would have allowed longer hunting and trapping seasons in state parks. “For me it’s an issue of what kind of democracy we have here in Wisconsin,” she says. “Generally majority rules,” she adds. A 2010 U.S. Fish and Wildlife Service survey found that 17% of Wisconsin residents had hunted in the last year. But Bohmann, who has been hunting since he was five, defends the use of dogs in hunting. Lowry and Smith would like to steer the conservation conversation away from hunting, trapping and fishing. Almost every one of the questions put to the public at the Conservation Congress meeting had to do with killing animals, says Lowry. Smith points out that one of the questions asked whether willow stakes, usually protected on DNR-managed land, could be cut since they are often used by trappers to mark and anchor traps. “Can we talk about wetlands rather than pulling willows for trapping?” she asks. Bohmann says that the Congress has recently formed an environmental study committee, but that hunting, fishing and trapping have to be part of the discussion since wildlife can destroy habitat. Hunting critics want a say in Wisconsin’s wildlife management – Isthmus | The Daily Page. With recent months having brought everything from the state’s first wolf hunt to a noisy debate over trapping and hunting in state parks, non-hunters and animal activists in Wisconsin are arguing that powerful hunting groups are wielding too much influence with the state Legislature and the Department of Natural Resources. Now, some of those activists are hoping to crash the party of one of state’s most influential pro-hunting groups — the Wisconsin Conservation Congress. Melissa Smith, a Madison resident who has helped lead opposition to wolf hunting in the state, has declared herself a candidate for the Conservation Congress, a popular statewide organization that advises the state Department of Natural Resources on outdoor sporting issues. Though she said she is not opposed to sustenance hunting, Smith said she is concerned that the voices of non-hunters are not being heard or heeded on issues such as the wolf hunt and the expansion of hunting and trapping in state parks. Both issues are the subject of questions that will be asked at Conservation Congress meetings to be held simultaneously Monday night in every county. Smith plans to run as a delegate at the Dane County meeting, which will be held at 7 p.m. Monday at Sun Prairie High School. The Conservation Congress was created by the state Legislature to advise the DNR on hunting, fishing and trapping as well as broader conservation issues. Every spring, the group holds meetings on the same night statewide to elect delegates and to vote on a long list of issues. Anyone can attend and cast votes. This year, in addition to dozens of questions about obscure changes in fishing and hunting rules, the questionnaire includes queries about whether dogs should be used to hunt wolves, whether hunting and trapping in state parks should be expanded, and whether a number of hunting seasons — such as those for bobcats and coyotes — should be extended. Rob Bohmann, chairman of the organization, said that because of the prominence of several hunting issues in the past year he expects a number of animals rights activists and their supporters to attend meetings and put candidates up for election, especially in Dane and Milwaukee counties. Delegates are important because they serve on committees and help shape and present the organization’s agenda. Smith’s candidacy has caught the interest of some groups, such as the Dane County Humane Society, that have not traditionally been involved with the Conservation Congress proceedings. Others also say they are concerned about the views of non-hunters getting drowned out by outspoken hunting groups such as the Conservation Congress or the Wisconsin Bear Hunters Association, which helped push the wolf hunting season through the state Legislature. Few people have been more vocal — and more of a lightning rod — on the issue than Patricia Randolph, an animal rights activist who became the first staunch hunting opponent to be elected as a Conservation Congress delegate when she won a position in Dane County in 1999. She served through 2001 and her term was marked by controversy, including a dustup in which she was warned by Conservation Congress leaders that she would be censured or removed if she spoke against hunting. Randolph maintains that few non-hunters know about the Conservation Congress and the power the organization wields on hunting issues with both the DNR and the state Legislature. The problem, she said, is that the views of the organization are representative not of the general public but of hunters, who make up a minority of the population. As a result, Randolph said, hunting — including seasons on everything from wolves to mourning doves and proposed seasons on sandhill cranes and even gulls — seems to be expanding even in the face of what she says is opposition from the general public on issues such as wolf hunting or trapping in parks. “We are totally disenfranchised,” Randolph said. Smith said she is emphasizing her opposition to wolf hunting with dogs and the expansion of hunting and trapping in state parks. But she said she also intends to push the congress to take stronger stands on conservation issues such as the protection of wetlands. Bohmann, however, said that the strong push by the hunting community in recent years to add more seasons and encourage more hunters is necessary because as the number of hunters drops, they lose their power to influence decision-makers. Bill Cosh, a spokesman for the DNR, said the agency does pay close attention to the views of hunters and those who participate in other outdoor sports such as trapping and fishing. But Cosh also said the DNR promotes many non-hunting activities such as camping, hiking, biking, wildlife observation, and skiing. Bohmann said he welcomes those with diverse viewpoints to attend the Conservation Congress meetings and to run for the delegate positions. But he said that there has to be a willingness to compromise and he expects everyone on both sides of the issues to respect opposing views. Madison resident hopes to bring voice of non-hunters to Conservation Congress : Wsj. The Wisconsin Conservation Congress plans to ask the public whether a hunt is a good idea at its spring hearings Monday, less than a month after a Republican bill that would have created a hunt died in the Legislature after bird lovers railed that hunters already kill enough animals. The question promises to re-ignite a heated debate. Wisconsin prides itself on its hunting heritage. Hunting advocates argue the sandhill population is out of control and the birds devour farmers’ corn seeds. But the state also is home to the International Crane Foundation, one of the world’s leading crane protection organizations, not to mention throngs of people who admire sandhills. PLEASE. 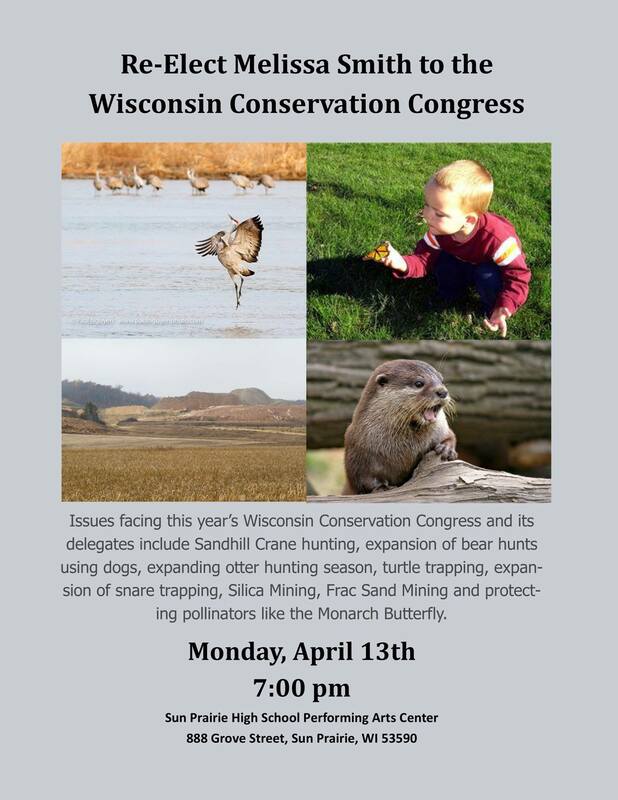 Attend your local Conservation Congress meeting at 7:00 p.m.on Monday, April 9, 2012 and vote NO on the sandhill crane hunt in Wisconsin. This is VERY IMPORTANT. Here is a complete list of Conservation Hearings in your area. 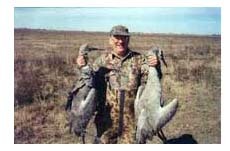 Wisconsin sportsmen to sound off on crane hunt – JSOnline. Wildlife Ethic intends to do everything we can to democratize wildlife stewardship and create respect for the web of life that we are destroying – wildlife being the factor left out in Wisconsin. We hope you will join us in the Monday, April 9 statewide elections and vote on a crane hunt and other tweaking of hunts put in place over the years. We invite people who would like to run as candidates to contact us at Madravnspeak@gmail.com. It is a great way to serve your state and represent wildlife lovers for the first time to bring balance to governance of our commons. 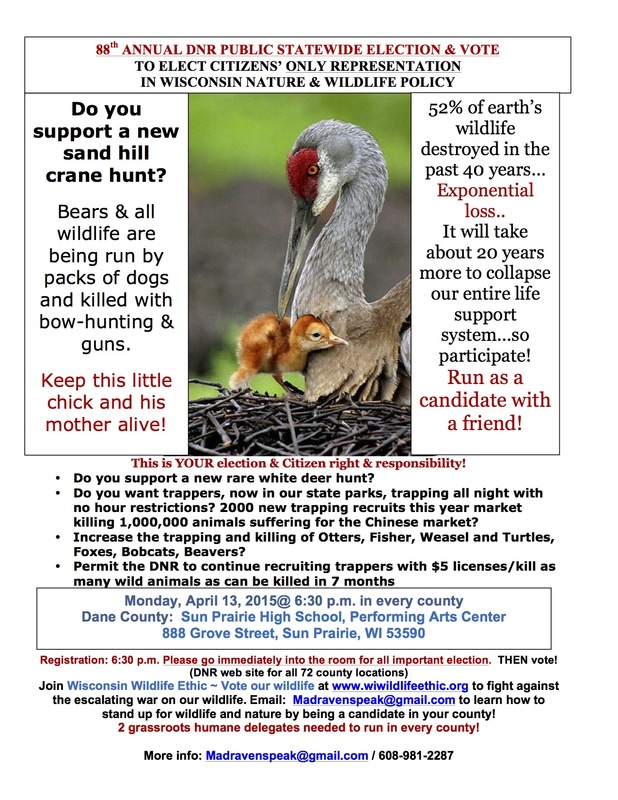 Conservation Congress Elections April 9, 2012 | Wisconsin Wildlife Ethic-Vote Our Wildlife.